Last year, team Alpine Shop discovered a hidden gem of Midwestern adventure racing: the Plot Pedal Paddle Night Race in northern Illinois. Our friends/rivals from Bushwhacker tipped us off about this fun event, and we were joined by our other friends/rivals GearJunkie/WEDALI for a good ol-fashioned adventure racing throw down. David and I led for much of the race, but Justin, Andrei, and Amy of GearJunkie/WEDALI emerged victorious, claiming the victory with a late-race charge. So this year, David and I were excited to bring Jeff along to compete in the extended version of PPP - an 18hr race starting at 6pm Saturday. It's a unique feeling to wake up in your own bed Saturday morning, first thinking "I get to adventure race today!" and then realizing "I'm not going to sleep again til Sunday night". I packed up my stuff, drove over to Jeff's to meet David and load the Sona-van, and then the three of us headed north to Dixon. We left with plenty of time to get to Camp Reynoldswood before the pre-race meeting at 4pm, but somehow time got away from us during a leisurely lunch stop and multiple pee breaks. Suddenly it was 3pm and we were still on Interstate 39! We drove as fast as possible on the county roads and pulled into Race HQ a few minutes after the 4pm meeting start. Suboptimal! We slid into the meeting and Dawn from Team Dragon AZ helped us fill out paperwork as Matt led the meeting. We frantically signed our lives away while also jotting down random notes about the course. 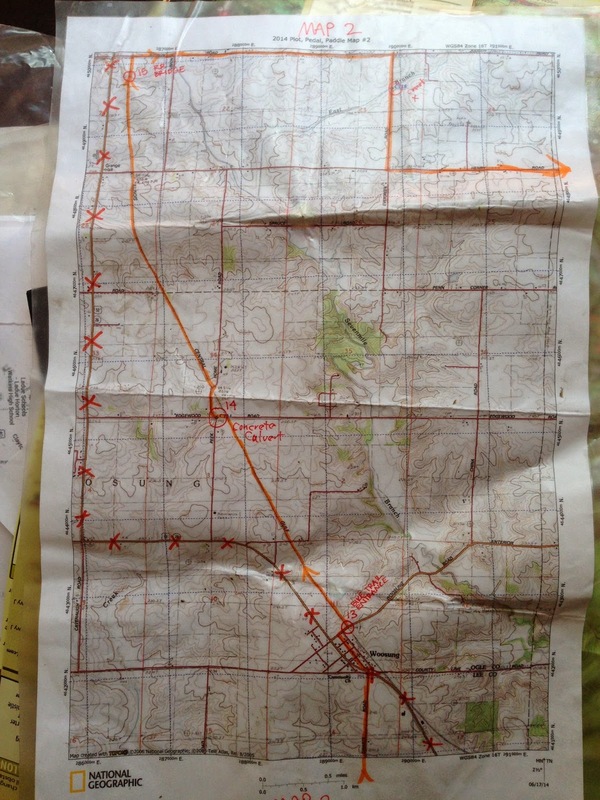 Maps were handed out shortly after, 4 sheets of 11x17 paper plus a passport and clue sheet. The three of us took stock of everything we had to do before the start in 90 minutes. 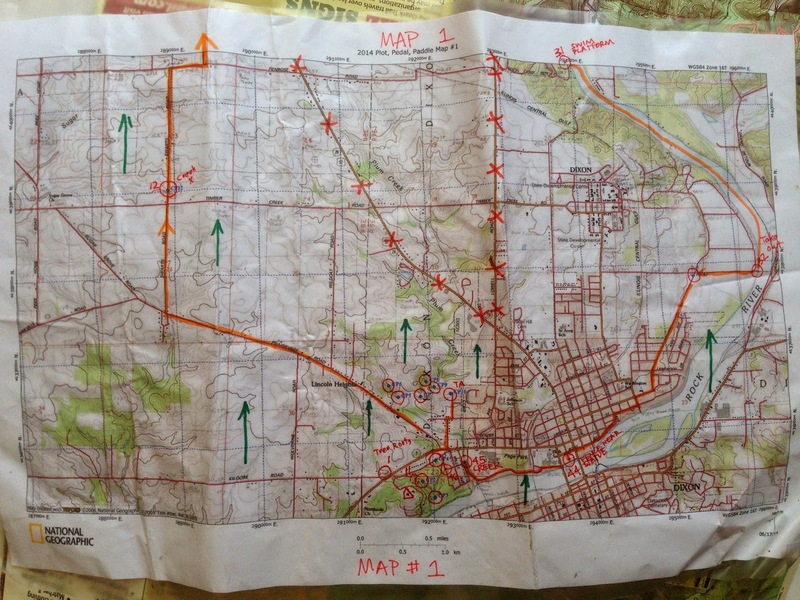 Plot maps, route plan, waterproof maps, drop paddle gear off, prep bikes, fill bottles, drive bikes to bike drop, change clothes, prep feet, plan food, prep packs with mandatory gear and food...oh my. First things first, we ordered ourselves a pizza to make sure we started out with full bellies. Then we plotted CPs on the map which was rather frustrating because there were several typos in the course booklet which had to be corrected verbally. This was a problem last year too! Once we got all the CPs plotted, I got my bike ready (lights, bottles, food) while Jeff and David planned our route, then they drove all 3 bikes to the bike drop while I laminated maps and got my pack ready. It was chaos, but also reinforced the team trust we've developed; as much as we like to do pre-race prep together, it was okay to break it all up because we know each other's preferences by now. I really had no idea what the course was so I just threw a bunch of food in my pack and hoped it would be enough. I finished getting myself ready at about 5:59pm, grabbed the second-to-last slice of pizza and shoved it in my mouth as I was running down to the start line. Jeff and David were running there, too. We met up and about a minute later, Matt and Dawn shouted "GO!". Trek 1: CPs 1-10 in order. We take off on the opening trek and my mind is still spinning with pre-race details. Less than 500m in, I realize I don't have a headlamp with me. David says he's got an extra one in his pack and that we should be looping back through HQ before sunset so I can grab it out of my bin then. Relief! We punch CP1 and CP2 with a slew of teams, and then by CP3 is just ourselves with Toporadicals (2-boy team from St. Louis, aka T-rad) and Michigan Racing Addicts (3-person coed, aka MRA). MRA seems to overshoot the sneakily-hung flag, and we are able to get a short lead along with T-rad. We race together with the boys from St. Louis through CP6, get a small gap on them at CP7, and then pull away at CP9. We run into CP10 in first place, which is also the bike drop. I'm thrilled to see the SegSlayer waiting patiently for me as we swap shoes in a hurry and fly out of there without seeing another team. It's a super-short ride back to HQ. Jeff remembered to top off David's and my tires before the race, but not his own, so his handling is a little squirrely on the pavement, but he adjusts well. We get back to Race HQ and drop our bikes. Still in bike shoes, we run the few hundred meters over to CP11 where Team Dragon AZ has set up a rope across a steep ravine. It's part-traverse, part-zipline and Jeff goes first with no issues, except the punch is on the other side and the passport is still in his pack. David is already set up on the rope so I grab the passport for my turn, which is what I'm holding in my mouth in the video. For us, the ropes were a little pointless since once we're done, we run back to HQ using a bridge to cross the same ravine. But I know for some people ropes are an adventure race highlight, and we didn't have to wait in line, so we're all good. Once I'm done, I join Jeff and David at our bikes where we all take care of things we forgot to do before the start - Jeff puts air in his tires, David puts in his contacts, and I dig my headlamp out of my bin. Okay. Now. Let's race! First part of bike leg - start at Race HQ (bottom middle of map) and ride NW, then straight N to CP12, then continue N.
We zoom out of Race HQ, through the town of Dixon, and onto some quiet country roads. Immediately we organize into a towing paceline with Jeff at the front. It feels good to finally be racing instead of fretting over pre-race details! The sun is starting to set and the Illinois countryside is just beautiful. We roll north to the town of Woosung, where we had a CP last year, the one hung on the gorilla. This year, we pass by the same gorilla and instead have a CP at the entrance to a rails-to-trails trail. We are biked north, then east. We punch CP13 at the entrance to the Joe Stengel Trail and are greeted by a luscious, green-grass-carpeted, deciduous-tree-shaded, gently-graded, wide trail. These are the reasons we love adventure racing - we get to discover cool little gems of outdoor living hidden in the most unlikely of places. I seriously feel like I'm riding through a scene in Alice in Wonderland. Everything is so green, and the setting sun highlights flecks of gold on the trees and grass. And best of all, there are no teams within sight! We motor on down the trail, grabbing CPs 14 and 15 along the way, and then turn east for CPs 16 and 17. The wind is strangely blowing out of the east so Jeff and David have extra work to do in front of our paceline. They crush it as usual and pretty soon we are rolling into a Baptist Camp for a 5-point trekking leg. map for Trek 2 - 5 CPs in order, then return to 18/24. Map stolen from Toporadicals. As we ride up to the picknick (sic) shelter, Dawn from Team Dragon AZ is there to greet us. She heaps praise on our race so far, saying that we're way ahead of schedule and the other teams. This is really nice to hear, but we've been racing long enough to know that there are a million ways to lose a race, and much fewer ways to win one. So we take the encouragement with trepidation as we get our lights and map ready to go for Trek 2. We run out of TA without another team sighting so we feel good about our lead. It turns out there is an entire network of mowed trails on the Baptist Camp property that are not on our map, and they are very tempting to take because the woods are thick with briars and thorns. We attack CP19 gingerly, getting stabbed and scratched with every step, and also thinking "it's probably hung on a trail somewhere that we don't even know about" but without the trails on our map, we have to be direct. David doesn't like the subtle contours so we bounce back out to the trail, run around to the top of the reentrant, and attack back into the undergrowth. It's extremely slow going, and we are soon greeted by voices and 5 other headlamps - Toporadicals and MRA have caught us! Turns out T-rad has already found CP19 so they tell us to keep going south as they hack their way out of the mess. Jeff eventually locates the control with MRA right on our heels, so together we fight our way out of the nasty woods. Now I have to mention something about racing against MRA. Alpine Shop is extremely blessed to have David as our navigator - he can make sense of a map better than most adventure racers in the country. And since there is no explicit rule against following other teams, we sometimes find ourselves having picked up a tail or two during races - teams that can keep up with us physically and just follow David's lead instead of doing their own navigation. NOT SO with MRA. 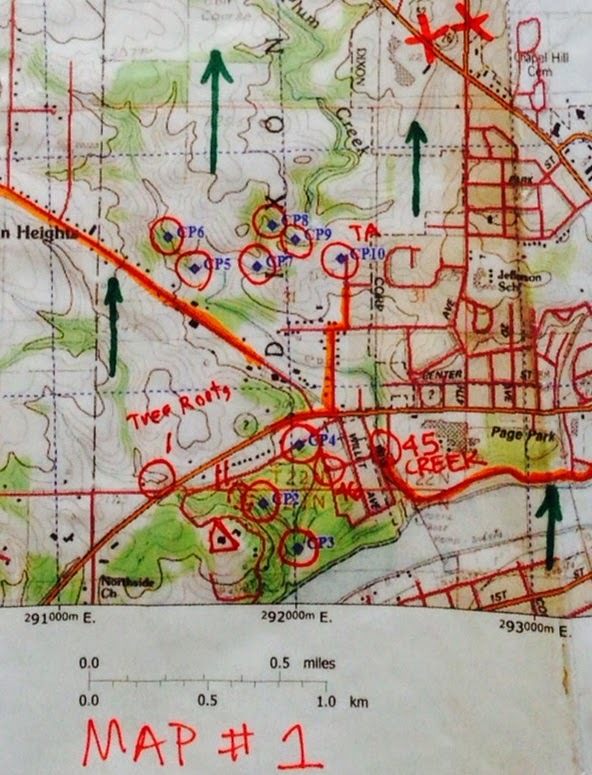 They made their own attack on CP20, striking off into the woods a bit earlier than us, and choosing their own route. Turns out, we overshot the control downhill, and ended up reuniting with MRA at the flag, but approaching from different directions. I was extremely impressed that they stuck to their own game plan, and it was a great route choice too! Good on you MRA! Our two teams emerge out of the woods together and we pass MRA on the road run to CP21. This clue is "naked tree" and it brings back horrible memories of the "change in forest maturity" clue from MISSION. What the heck does a naked tree look like? No leaves? No bark? Growing next to a stripper pole? Honestly, in the dark, all of the trees look the same and we are not excited about this attack. The woods are only slightly less thick than before so again it's slow going as we thrash around. MRA is with us too, but they are sticking to their own nav which I continue to be impressed by. After a while of flailing, MRA disappears, which can only mean one thing - they've found CP21 and we haven't. Not good. David does his best to relocate on the map, but it takes a while due to the subtle features and thick vegetation. We do our fair bit of wandering. Finally, FINALLY, David pings the CP with his headlamp and we breathe a sigh of relief. CP22 turns out to be relatively close by, and on the way to CP23, T-rad catches up to us after their own struggles at CP20. These woods are eating everyone alive! Back at the TA, Dawn tells us that MRA has about a 30-minute lead on us and T-rad. That is scary and we focus on transitioning swiftly onto our bikes. It's a short road ride to the paddle put-in, but we are determined to make up time. I am feeling super motivated so I pull at dirt-crit-effort for as much as I can. Jeff takes over for me about half-way through and we cruise into the paddle put-in having made up 10 minutes on MRA, and T-rad nowhere in sight. This is hugely motivating to us since it was a short bike! We rush through transition, getting our glowsticks and PFDs sorted and pushing off into the Rock River amidst a flurry of bugs. We put in on the right side of the map (CP27), paddled upstream to CP28, then downstream the rest of the way. 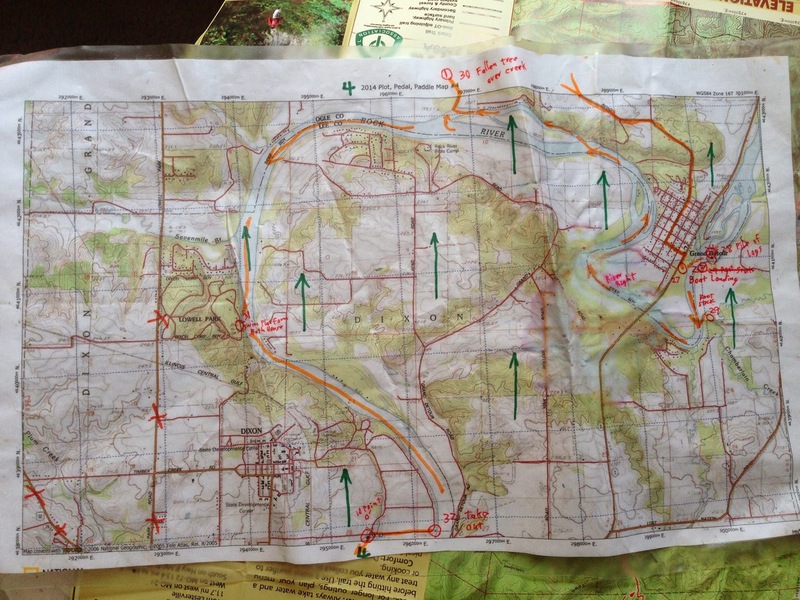 Sorry the map is marked weird, there were typos in the race booklet so we had to re-plot 2 points. Jeff guides us upstream on a flooded Rock River, and we hit CP28 cleanly before turning downstream. 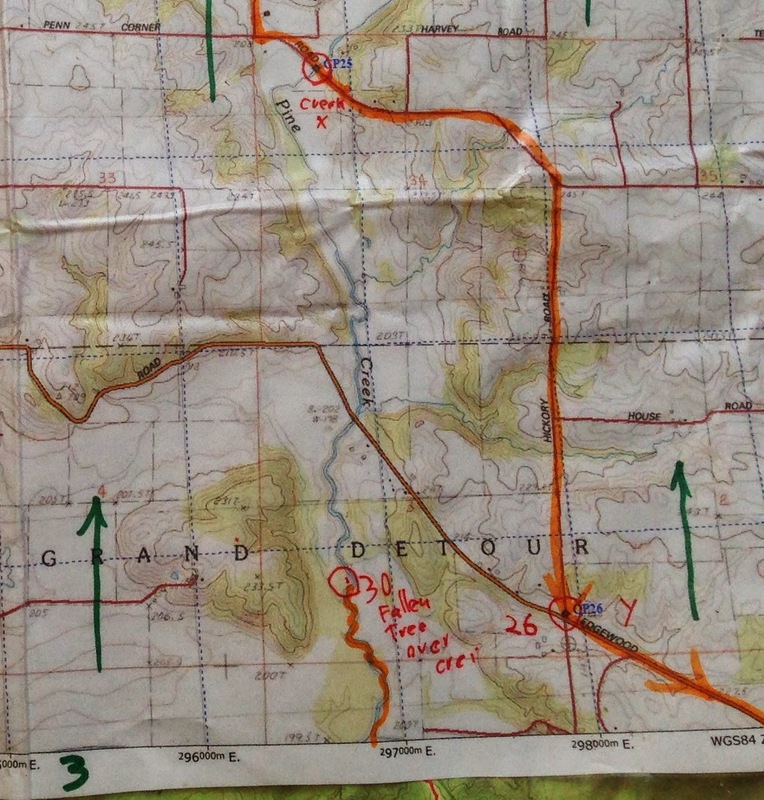 CP29 is on a tributary creek but based on the verbal hints given to us a the pre-race meeting, it's easy to find. Then we paddle on to another tributary creek for CP30, with the clue "fallen tree over creek". The main river is just south of the map cut-off. As we're approaching the tributary creek, we see the glowsticks of MRA emerge from it and continue downstream. Great! We're within striking distance! Jeff takes a split and we turn right to paddle up to the flag, expecting it to be obviously hung like the clue says, in a tree over the creek. The creek makes several shallow bends, and there are some trees fallen over it, but we're not seeing any flags. Oh well, keep paddling! After several minutes of this, we start to get a bad feeling. We should have seen the flag already. 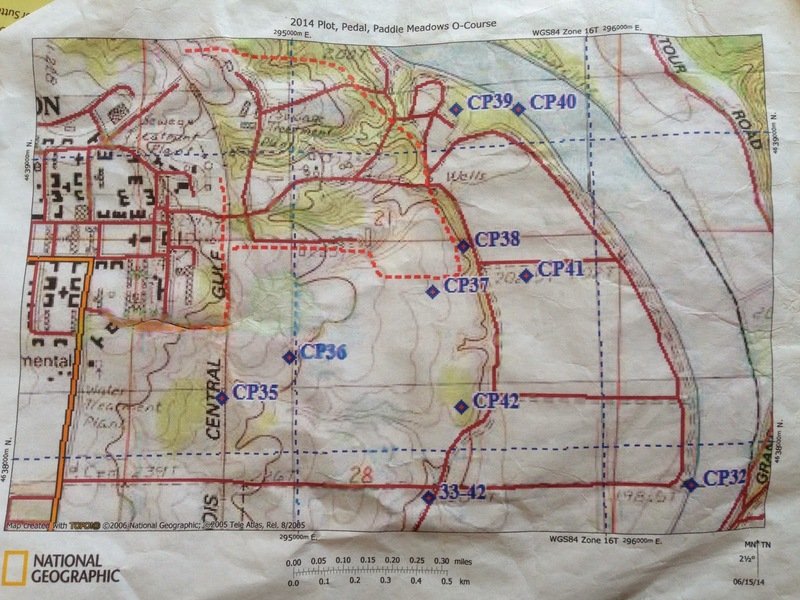 I examine the map and note a distinct bridge that would serve as a major catching feature, about 700m north of the CP. Thirty seconds later, we come around a bend and see said bridge. Oh nooooooooo. We just wasted a BUNCH of hard-earned time. We spin the boat around, paddling downstream and this time counting creek bends much more carefully. Sure enough, we find the control hidden in a tree overhanging the creek, just not completely across the creek like we were expecting. Shame on us for not paying closer attention to the map! We punch and get back to business trying to make up time on MRA after our 1.5k mistake. The rest of the paddle is fairly fast. The current is ripping along, and we're working hard to make up time. CP31 is a little sketchy, it's hung slightly on shore but David's eagle eyes spot the flag after a few minutes of searching. We have about 3km left to the finish, and I have to mention it's 3km that I will remember for a long time. Having made two fairly large mistakes (for an 18hr race), we are not feeling very keen on our chances of winning. MRA is a good team and they've proven that they can handle the difficult nav and unfriendly forests that seem to be the hallmark of the course so far. So we decide to take every CP as it comes, focusing on our own race and our own best effort. There is a fair bit of pep talking done by all of us, and by the time we reach the take out we are ready to throw down. Once we take out, we have about a 900m road portage to the next TA. After our river pep talk, we are ready to totally crush this. Jeff and David flip the boat onto their shoulders, I grab everyone's packs and paddles, and we RUN everything down the road. It is not comfortable, nor easy, but it is our best effort. By the time we reach the TA, the volunteer tells us we're in 2nd place by about 12 minutes. TWELVE MINUTES!!! We are elated to hear the time gap is that small, and hustle through TA and onto the next trek. Meadow Trek. Take out at CP32, portage to CP33, then trek CP35-42 in order. 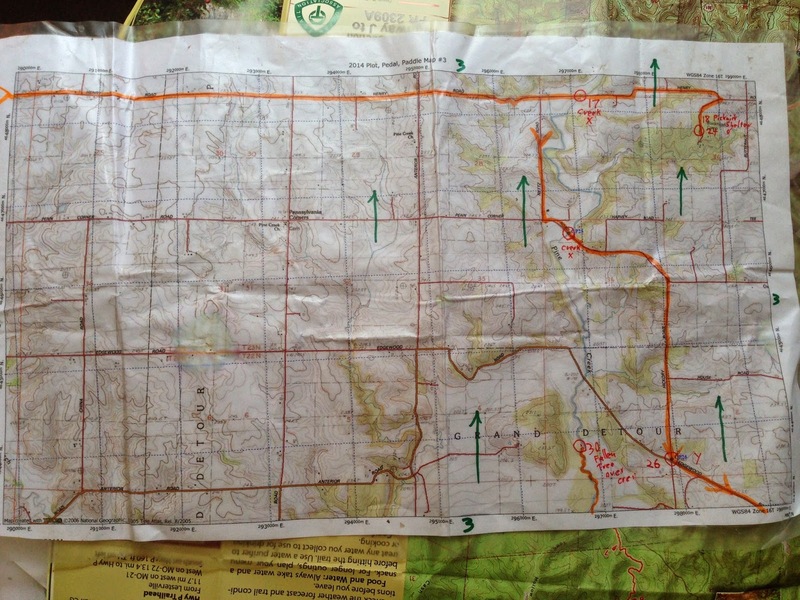 The volunteer also gives us a map with 9 CPs (CP34 was not printed so all teams skipped) and instructions to complete the trek in order before returning to TA. We've adjusted our strategy based on the first Baptist Camp trek - now we expect every CP to be a hassle and are ready for it. Ironically, CP35 is a pretty easy road/trail run, but after that it gets hard. Really hard, especially at night and with clues like "thicket" and "cluster of trees". CP36 has us in a grove of thickets, and we check what seems to be ten of them before finding the correct one. CP37 is where we meet up with MRA, again still executing their own game plan. It takes us A LOT of time to find the flag. We attack at least 4 times, finding CP38 in the process but not being able to punch it just yet. It's very tense out there - we see MRA's lights flashing around as we continue to attack CP37 from different locations, without much success. David finally finds the flag after much gnashing of teeth, we punch, hustle back to CP38 for the punch, and then on through the rest of the course. CP39 is actually my favorite since it's "in a marshy area" and the frogs' voices serenade us as we wade through the knee-deep swamp. It kind of reminds me of Star Wars, #nerdalert, except I'm hoping we avoid any leeches. CPs 40 and 41 go easily enough, except only about half of the roads shown on the map exist in real life, but David battles through and we punch both with relatively little issue. Then we carefully attack CP41 with the clue "in a well", trekking back and forth on a big, unmapped east-west gravel road, before spotting a slight opening in the vegetation that might have once been access to a house, or, perhaps, a well? We follow the overgrown path bang onto the control. Then it's a short, infinitely relieved jog back to the TA for the last trek. We haven't seen anyone in the woods since CP37, and with the difficulty of the navigation, we're guessing that we've gained the lead. Final trek from CP33/43, back through town to the Race HQ. The volunteer confirms that we're in front and, what's more, NO OTHER TEAMS have come in from the paddle. What happened to T-rad? Something weird must be going on. But we have no idea how close MRA might be to us, so we excitedly run off towards the finish line, 4 miles of mostly road running through Dixon and into Camp Reynoldswood. It's easy terrain, for sure, but the boys push the pace and my hammies start to tighten up. Not comfortable, but nothing that will stop until the finish line, so I grit my teeth and keep up as best as I can. The navigation is easy and Jeff keeps us entertained by stopping and standing in a "No Stopping Or Standing" Zone, and having a chat with some ducks as we wade through another creek. As the sun is starting to light up the morning sky, we run into Camp Reynoldswood and across the finish line in first place! I am really, really proud of our effort at Plot Pedal Paddle 18hr. We won, and that's cool because we qualified for USARA Nationals, but what's more important was our mental game. We clawed our way back from two rather egregious mistakes, kept believing in the team, and didn't give up. That is one of the most important things in adventure racing - so many things can go wrong to your team and others, you just can't give up on a race because your behind by a few minutes or even a few hours. You never know what's happening to teams around you so you just focus on executing your own best race. Simple. Do your best. And that's what we did! I also want to mention one more thing about Toporadicals. They had a major nav error on the paddle, missing CP31 and 32, which resulted in more than 10km of upstream paddling in a flood stage river, a very difficult task. It would have been so easy for them to say "let's just skip those two" and continue on with their race. But no, they decided that they still had enough time to clear the course, so they paddled ALL THE WAY BACK to CP31, then back downstream to CP32, then continued on, clearing the rest of the course. I can't say enough how impressed we were when we saw them at the finish line and heard their story. That is also another great thing about adventure racing, you get to meet incredible determined and tough individuals. Good job, T-rad! Congratulations!! And great report, as usual. Great report! Am new to the sport and am trying to learn. Love reading your race reports! What are all of the green arrows? Is that so when the map is folded you know what's north? What else besides CP's do you make sure you put on the map? Hey Shannon! thx for the comment, so glad that these can be useful to you! the green arrows are just north arrows. David uses them to help orient the map as we're racing. we try to put them around the course but without obscuring it. usually we also write the clues on the map. if it's a regular clue that has an orienteering symbol (i.e. spur, ditch, reentrant, etc), we'll just put the symbol to save space. but if it's a weird clue then we write as much of it as we can (i.e. fallen tree over creek). that kind of stuff is always on the map. sometimes we'll also write down cutoff times for certain CPs if they are applicable. I can't believe you ate all that pizza pre-race. I would have needed to take a nap after CP2. But, if Alpine Shop eats pizza pre race, now I have to. Just in case it's the reason your team rules. Does pizza = better navigation? Did you just give away the secret?!! !